Socialist Realism Across the Globe! Comments Off on Socialist Realism Across the Globe! Monuments in Africa, made in North Korea, inspired by the Soviet Union! 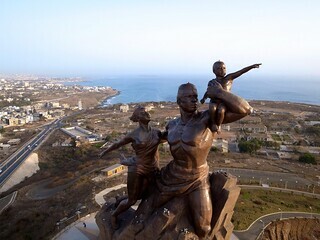 Commissioned by Senegal, Pyongyang’s Mansudae Overseas Projects is responsible for the 160-foot African Renaissance Monument erected in 2006. Operated by the North Korean government, Mansudae’s factory specializes in the production of gargantuan—yet fairly inexpensive—monuments largely inspired by a Soviet aesthetic. Purportedly embodying the end of Senegal’s colonial history, the statue was ordered by former president Abdoulaye Wade. Mansudae’s sculptures brandish the earmarks of Socialist realism, depicting sharp figures, larger than life and imbued with state ideology. This Soviet motif, however, is not limited to the outskirts of Dakar. 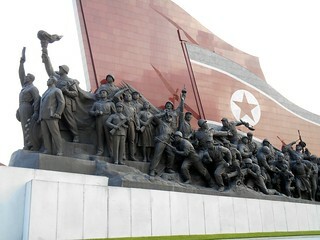 Senegal is among 18 other states that are home to Mansudae monuments. The majority of countries outsourcing to the Pyongyang-based company find themselves in Africa and Asia. Apparently, the legacy of the U.S.S.R.’s aesthetic regime crosses continental boundaries. Sarah Cascone. “The North Korean Art Factory Cranking Out Soviet-Style Monuments.” ArtNet, August 5, 2014. Accessed September 5, 2014. https://news.artnet.com/art-world/the-north-korean-art-factory-cranking-out-soviet-style-monuments-73226. Ella Morton. “The Controversial Senegalese Monument Built by North Korean Propaganda Artists.” Atlas Obscura, August 4, 2014. Accessed September 30, 2014. http://www.slate.com/blogs/atlas_obscura/2014/08/04/the_african_renaissance_monument_in_dakar_senegal.html. Victor. “The North Korean Monuments in Africa.” Art Cocktail, December 1, 2014. Accessed December 10, 2014. http://artcocktail.mallforarts.com/2014/12/the-north-korean-monuments-in-africa/.